You can drive up and load directly into almost all units making them the most convenient storage solution possible. Overflow storage: think garden shed, small loft space or a nice generous understairs cupboard. Suitable for packing up the average 1 bedroom flat or single garage. Appropriate size for packing a three-bedroom house or double garage. Will generally take the contents of a 4-5 bedroom house, depending on the scale or your furniture. An excellent place to store. Clean, tidy, secure. Excellent facility. Friendly and efficient service. I have found it good to be able to just pull up and unload/load without having to traipse through buildings or use lifts! It has been a very useful and handy facility. Our stuff stayed in excellent condition. DON’T MISS OUT! FANTASTIC SAVINGS ON TOP OF OUR REGULAR DISCOUNTS, FOR A LIMITED TIME, ONLY! Take advantage of bulk buy discounts and store securely without cluttering your showroom or work space. Keep a comprehensive archive offsite, with drive-up access when you need it. Keep the valuable, bulky equipment which is essential to running your business nice and secure, in an easily accessible, drive-up unit. 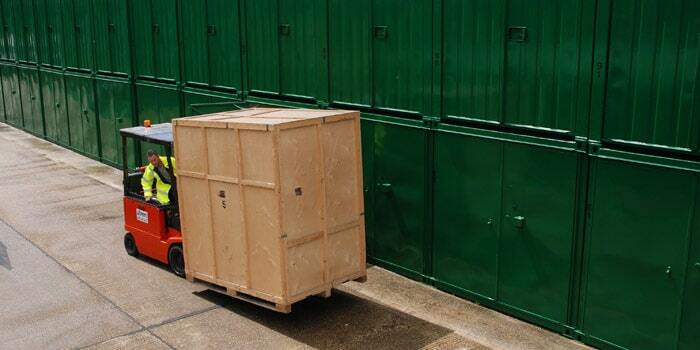 Are you a removals company, looking for storage facilities? 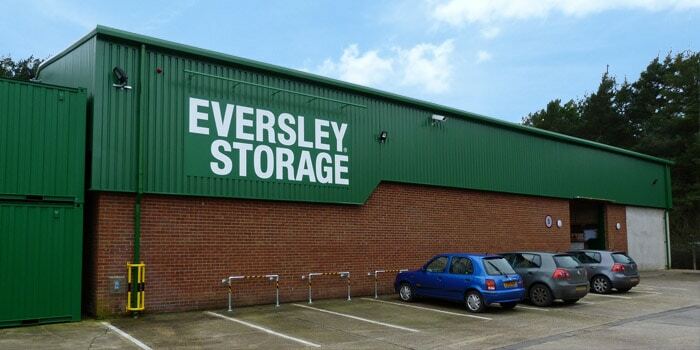 Eversley Storage is perfect for removals firms. We started welcoming removals firms very soon after opening in 1988 and have evolved our business to sit conveniently alongside yours. This is the best option for removals companies. Our sturdy and well-appointed warehouse can take up to 160 wooden boxes, which measure 5’2″ side, 8′ high and 7’2″ deep. These boxes are perfect for removals firms. They are low cost, enabling you to keep your quote competitive. Should you have a lorry of the appropriate size, our wooden boxes can be taken to your customer’s property, filled onsite and then brought back, saving you time. To find out more about costs, call us on 0118 932 8328 or use our contact form. The removals firms using our warehouse operate either by using our forklift truck service to load boxes onto their vehicles, or by simply using the boxes as low cost conventional storage units. Both approaches to this facility work very well. We have a well-maintained hard-surfaced road network so that our units can be accessed directly even by the largest road-going vehicles. We will bring the wooden household removals boxes that you need out of the warehouse so that you can load and unload easily from your lorry, if you are not loading the box directly onto your vehicle. If you are looking for household or general business storage, see tabs above. How are your dimensions given? Unit measurements are given length, width, height. Measurements are external. They are generally accurate, but of course, if you are storing an item that you know is going to be very close to the maximum dimensions of your unit, you may need to come and measure precisely, before bringing the item into store. If you aren’t sure what size you need, do come to see us and we can show you into the various units to help you get a good idea of the space. The dimensions are given on our Sizes page, in Metric and Imperial. The cubic and squared measurements are given also. Firstly, measure your largest item, to get your minimum height and length of unit. Then visit our Sizes page, to see illustrations of approximate capacity related to house and vehicle size or for businesses, numbers of pallets or archive boxes that can be accommodated etc. What if I need more space, or less? Many of our customers do make these changes. 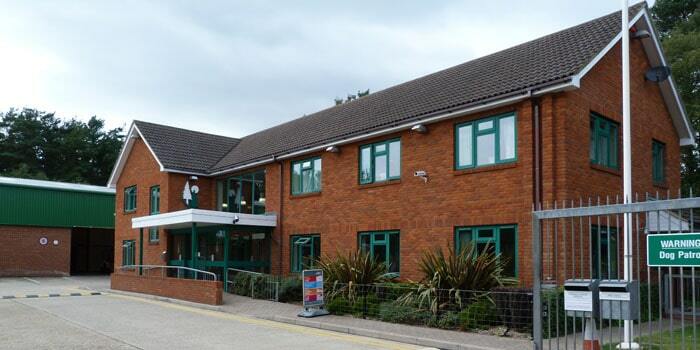 Subject to availability, we can easily arrange upsizing, downsizing or taking additional units. 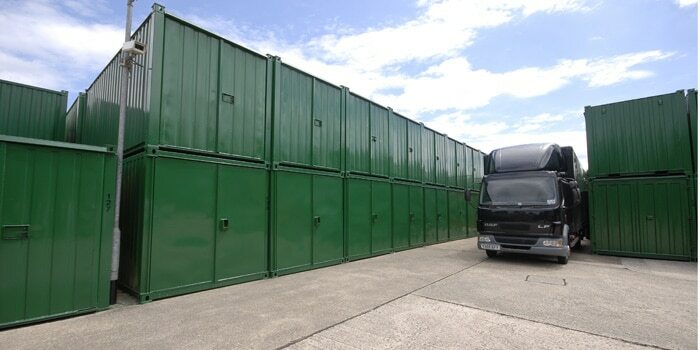 Do take a look at our Storage Unit Sizes page to work out which size unit is right for your current needs or call our friendly storage experts now on 0118 932 8328. Should I hire a first floor unit or a ground floor unit? The main considerations for this are price, loading or unloading and access. First floor units are cheaper, but are accessed via a moveable flight of stairs. If you have a company helping you to load your items or your items are not especially large or heavy, a first floor unit might represent better value. But if you are doing all your loading yourself and have large, heavy items of furniture, first floor storage might not suit you so well and a ground floor unit would be more convenient for you. Do come and have a look to get an idea of how you would get on. Our sales staff will be happy to show you the access arrangements for a first floor unit so that you can choose for yourself. If you have any other queries, give us a ring 0118 932 8328. How do your storage units compare to room storage? Our storage containers offer an excellent alternative to room self-storage. Almost all of our units are direct-access, meaning that you can drive right up to them and there is no additional charge whatsoever for this. Our prices compare extremely favourably. We are located out of town, on a main road so you don’t have to struggle with town traffic to get to us and there’s plenty of space for vehicles of all sizes. How big are the doorways to the units? All of our units, with the exception of the Extra Small size, have an 8 foot double doorway on the front. Both doors open fully to allow easy access for large items. There is a step up into the unit, but we can provide ramps if you are intending to store a car. Do visit and ask to see our show unit, to get a good idea of how it would be to load and unload. We have a tape measure that you can borrow if you need to take particular measurements. If you have any other queries, pop in and see us or give us a ring 0118 932 8328. Can I store a car in a storage unit? Yes. Below you will find a video of us tucking our Marketing Manager’s car away in one of our units! Do come and measure if you need to check the width of the car will be accommodated or give us a ring if we can help with any other queries 0118 932 8328. What types of vehicle can I store? We have customers storing classic and luxury cars, ride-on garden equipment such as mowers, quad bikes and motorcycles. If you would like to store a vehicle taller than a standard car, you would need to measure carefully to make sure that it can be accommodated – do pop in if you need to ask questions or look at a unit yourself. Do you have 40′ units? No, we don’t – our largest unit is the 30 footer. Information about all our sizes is here. If you need more space, our friendly, experienced staff are happy to talk through what combination of units would suit you – pop in and see us or give us a ring 0118 932 8328. What if I only need to store a few bits that I can’t accommodate at home? Illustrations and estimates for what each unit can accommodate are given as a suggestion, only.